Brilliant Fourth Industrial Revolution Future Gaming Google Stadia Trending videos Youtube Stadia – Google’s Game Changer? Googles newest product Stadia, is their vision for the future of Gaming. Stadia is a cloud gaming service operated by multinational technology company Google. It is capable of streaming video games in 4K resolution at 60 frames per second, with support for high-dynamic-range, to players via the company's numerous data centers across the globe. It will be accessible through the company's Google Chrome web browser. The service's integration with YouTube, and its "state share" feature which allows viewers of a Stadia stream to launch a game on the service on the same save state as the streamer, has been used as a selling point for the service. It is compatible with HID class USB controllers, though a proprietary controller manufactured by Google with a direct Wi-Fi link to data centers will be made available alongside the service. Known in development as Project Stream, the service was debuted through a closed beta running Assassin's Creed Odyssey in October 2018, with a public release planned in late 2019. It is the direct competitor to Sony Interactive Entertainment's PlayStation Now service, and Microsoft's Project xCloud. Stadia is a cloud gaming service, and requires no additional computer hardware, only requiring the device to have an Internet connection and support for Google Chrome. Stadia works atop YouTube's functionality in streaming media to the user, as game streaming is seen as an extension of watching video game live streams, according to Google's Phil Harrison; the name "Stadia", plural of "stadium", is meant to reflect that it will be a collection of entertainment, which the viewer can choose to sit back and watch, or take an active part in. As Google had built out a large number of data centers across the globe, the company believes that Stadia is in a better position for cloud gaming compared to past endevours like OnLive, PlayStation Now, and Gaikai, as most players would be geographically close to a data center. 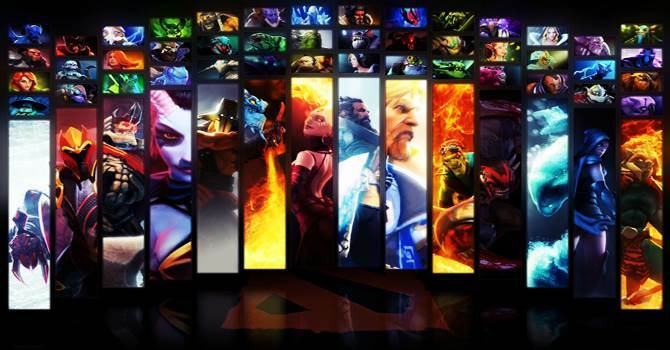 Stadia supports the streaming of games in HDR at 60 frames per second with 4K resolution, and anticipates eventually reaching 120 frames per second at 8K resolution. Players can start games without having to download new content to their personal device. Players can opt to record or stream their sessions onto YouTube through Stadia. Viewers of such streams can launch the games directly from the stream with the same save state that they were just watching. 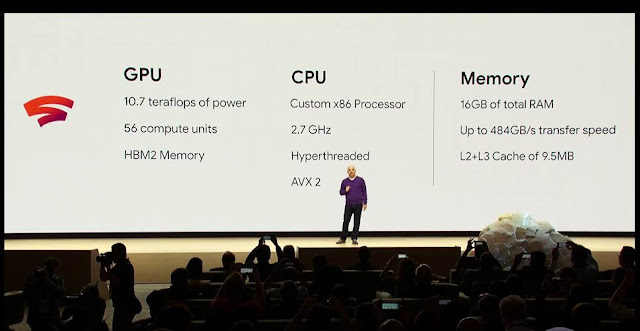 While Stadia can use any HID-class USB controller, Google developed its own controller which connects via Wi-Fi directly to the Google datacenter in which the game is running, to reduce input latency. During its GDC 2019 keynote reveal, Google confirmed that the controller would also feature Google Assistant, which will automatically search YouTube for relevant, helpful videos related to the game they are currently playing at the touch of a key. 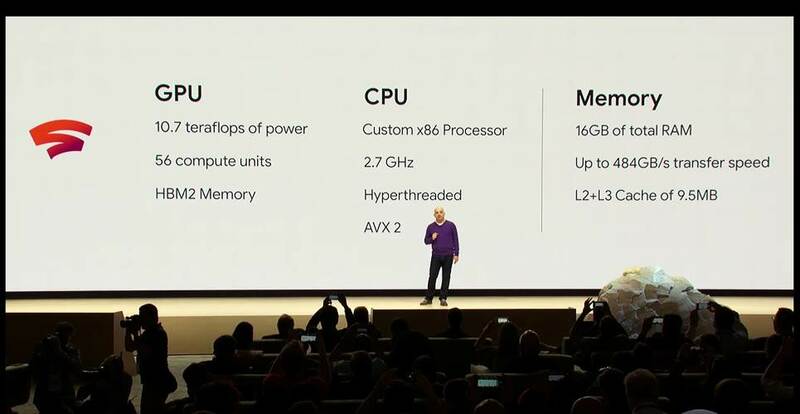 Upon launch, Stadia's cloud hardware will initially use a custom Intel x86 processor clocked at 2.7GHz, with AVX2 and 9.5 megabytes of L2+L3 cache. It will also use a custom AMD GPU with HBM2 memory, 56 compute units, and 10.7 teraFLOPS. The service will also have solid-state drive storage, support for 484 gigabytes of bandwith, and 16 gigabytes of RAM shared between the GPU and the CPU. Three games are planned to launch on Stadia. Assassin's Creed Odyssey, which was used in the Project Stream test in October 2018 in 1080p resolution, and id Software's Doom Eternal, are both planned to launch with 4K resolution, 60 frames per second gameplay, and HDR support. An unannounced third game being developed by Q-Games will utilise the platform's "state share" feature. Doom (2016) was also demonstrated at GDC, but it is unknown whether the Stadia port is intended to be publicly available or only as a demonstration. Phil Harrison stated in an interview with Ars Technica that "a couple of leading fighting games" were in development for the platform, but did not mention any specific games. 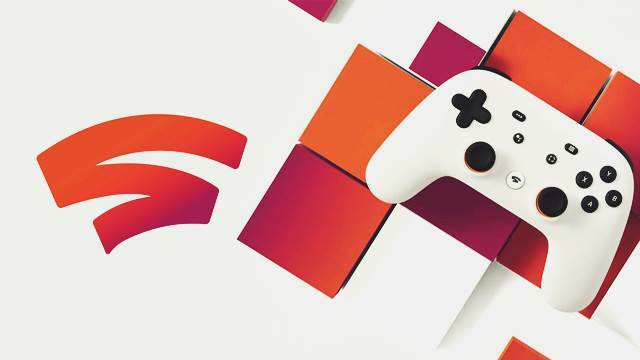 In addition, a first party developer led by Jade Raymond named Stadia Games and Entertainment will develop additional games for the platform.